I'd been wanting to make myself a pair of slippers for a while when I stumbled across this pattern at Pilgrim Purse - and Poetry. I loved the rounded, clog shape of her slippers and immediately set my sights on making a pair. The pattern is perfectly accurate as written, but it was a little confusing for this non sock-knitter. I made my slippers according to the directions for the standard woman's slipper. Using the magic loop method, I knit the entire project using circular needles. For those of you unfamiliar with magic loop, this video from Knit Picks is super handy (coincidentally, I used my Knit Picks interchangeable circular needles for this project--I love them)! 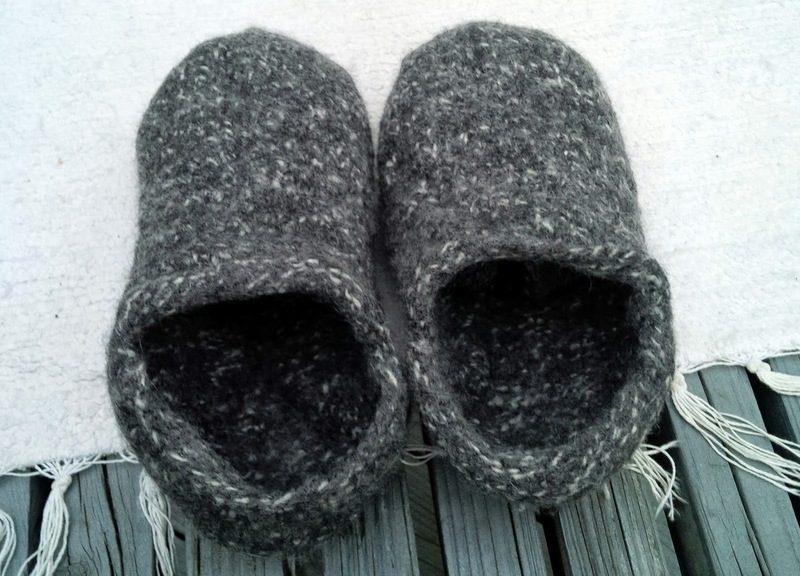 I knit my slippers using two strands of Patons worsted weight Classic Wool held together (Dark Grey Marl and Dark Grey Mix). After I cast on (I used the long tail method), I counted 24 stitches, then pulled my loop of cable through (leaving 18 stitches on the other side). Following the instructions, I knit one complete round. Then I worked the first 24 stitches (before the cable loop) in stockinette for 15 rows. 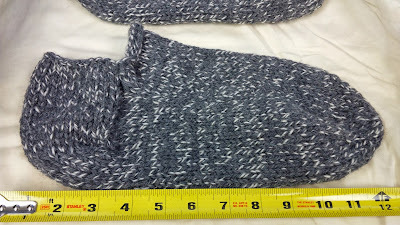 Making the gusset, knitting the length of the foot, and decreasing for the toe are fairly straightforward. I have a front-loading, high efficiency washing machine. I also have very small feet (about size 6). I probably should have followed the pattern for narrow slippers and knit a bit less than 7 inches for the length of the foot. To make due, I did some serious felting on these babies. I ran the slippers through three wash cycles using hot water, and they could probably stand another wash. The pattern tells knitters to make sure that the slippers don't go through the spin cycle, because deep creases will form in the fabric. This is so true! I didn't get to them on one of the wash cycles and they ended up spinning a bit; you can see the creases in the slippers. To block the finished slippers, I rolled washcloths up and pushed them into the toes of the slippers while they were still damp. I haven't trimmed the opening of the slippers to make them even more cloggy--I'm just enjoying them as they are for now. Be sure to visit Pilgrim Purse and Poetry to check out this awesome pattern. Be creative and enjoy!